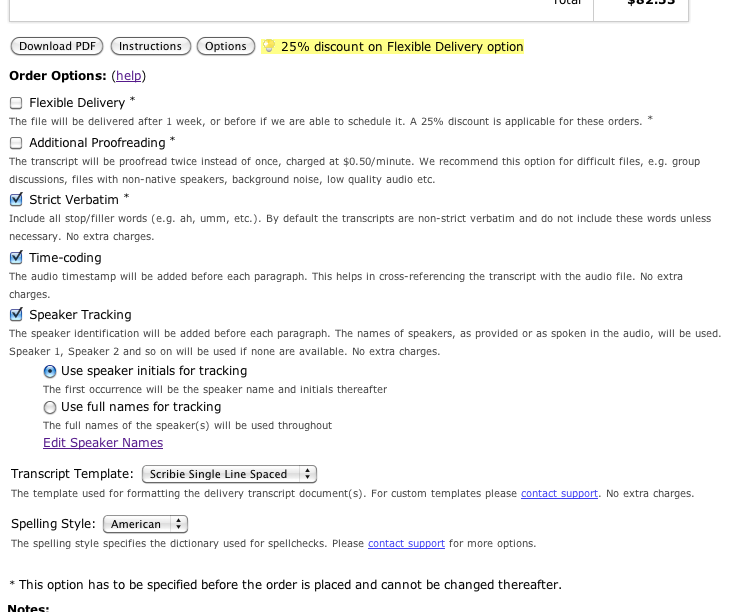 We have added new transcript order options in the Invoices page. The Option button just below the table brings it up. A screenshot is below. The Flexible Delivery files are delivered anytime with a week instead of the normal 1 day. If within the week we are able to fit in the file in our delivery schedule, we will deliver it. Otherwise you are guaranteed delivery on the seventh day. We offer a 25% discount for these orders. This option has to be specified before the order is placed. It cannot be enabled/disabled afterwards. 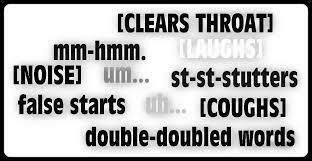 Proofreading is part of our workflow where we correct all inconsistencies in the combined transcript. It drastically improves the quality of the transcript. For difficult files (eg. files with poor audio quality, background noise, speakers with unclear accents, non-native speakers, etc.) you can request an additional proofreading. We pay special attention to these files and ensure that you get an accurate transcript regardless of the difficulty level of these files. We charge an additional $0.50 per minute of the audio for additional proofreading. Set this option if you want us to include all ah’s, uhm’s, umm’s as spoken in the audio file. By default our transcripts are non-strict verbatim transcripts which means that these filler words are not transcribed unless necessary (ie. for a affirmative or negatory answer to a question). However these filler terms can indicate hesitation or confusion on the interviewee’s part and including them may prove useful. If this option is enabled then all the filler terms will be included in the transcript. This option has to be specified before the order is placed. It cannot be enabled/disabled afterwards. No additional charges apply for this option. By default we time-code the transcripts. The time-code is the time stamp of the audio when the particular paragraph started. It is useful when you want to cross check the transcript agains the audio file. Time-codes are formatted as H:MM:SS. This option can be enabled/disabled anytime from the Invoice Details page. No additional charges apply for this option. Before each paragraph we prepend the speaker name or initial which identifies the person who was speaking at that time in the audio file. If speaker names are provided or spoken in the audio, then they are used. If not we use the generic format of Speaker 1, Speaker 2 and so on. This option has two sub-options relating to formatting of the names. If speaker initials is chosen then the first occurrence will be the full name of the speaker and rest will be initials. Eg. if the name is Rajiv Poddar then the first time Rajiv speaks the speaker tracking will contain Rajiv Poddar and all subsequent one’s will be RP. This is illustrated in the sample transcript. If full names option is specified then the full name will be used throughout. The Speaker Names link allows you to specify each speaker’s first and last name. The transcripts are prepared as a text file and before the delivery we convert the file to MS Word, OpenOffice Text and Adobe PDF format. We use a template for this conversion. There are four different templates you can specify; Scribie default template with single/double line spacing and blank template with single/double line spacing. The Scribie default template has a title page, a header, footer and the last page contains some stats. 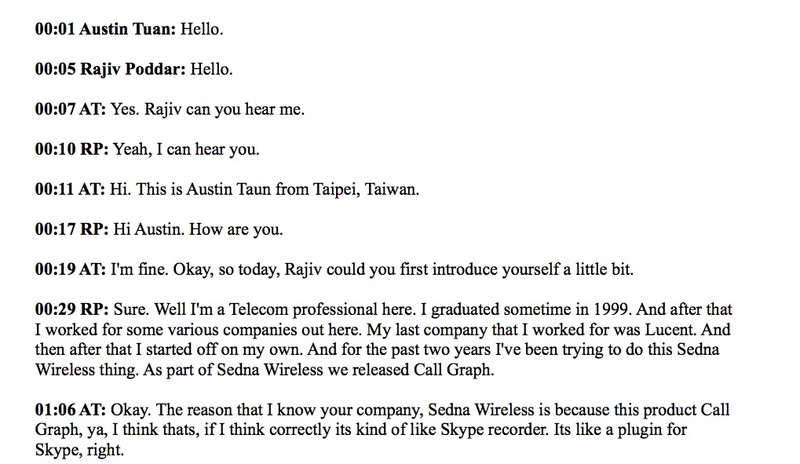 Pleas check the sample transcript for an example. Blank template only contains the transcript. Double and single line spacing adjusts the spacing in between the lines in the delivered file. If you want your own template to be used instead then please contact support and they will help you out with it. The spelling style of the transcript can also be specified. Currently we support American, British, Australian and Canadian styles of spelling. Please contact us for more options.